The MS Elbe Princess is a stunning ship which cruises along the Elbe from Berlin to the heart of Prague, offering a selection of modern staterooms, activities and regional cuisine. 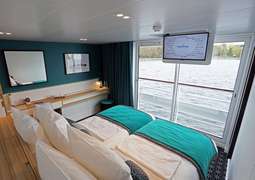 All cabins on board the MS Elbe Princesse are furnished with modern amenities to ensure you have the higest level of comfort on your cruise. The large panoramic windows ensure beautiful scenery throughout your entire trip. 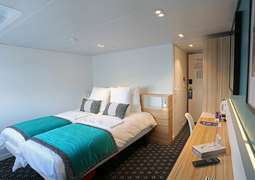 Basic features of each room include a bathroom with a shower and toilet, hair dryer, adjustable air conditioning, a TV, safe, radio and telephone. All the excellent meals on board are prepared by the skilled kitchen staff. The wonderful breakfast, lunch and dinner menus are inspired by the best of European cuisine as well as regional specialties. The needs of all passengers are catered for on board the MS Elbe Princesse. The Sun Deck is ideal for sunbathing, reading a book or mingling with other passengers as you cruise along the scenic River Elbe. Regular lectures will provide the most interesting information about the regions enroute. If you would like some peace and quiet away from the hubbub of the rest of the ship there is the library. Evening activities include quiz and dance nights with live music.